Haunted by history: The derelict beauty of Dublin’s ghost signs | SHEmazing! These vestiges of the city's distant (and not-so-distant) past are known as ghost signs. They usually come in the form of advertising, often painted on the brick sides of buildings, but are also manifested in carved signs and other adornments. The signs are sometimes for businesses that are still extant but have just left those particular premises. Once you start spotting these reminders of Dublin's history, it's hard to stop. I was first introduced to ghost signs by my Economic Policy and Business History lecturer, Professor Frank Barry, in my final year of college. We were tasked with walking around the city, heads tilted up to look for ghost signs that were hiding in plain sight. I was astounded by the number I discovered and found myself happy to wander around city centre for hours on end, trying not to bump into people as I kept my eyes peeled for ghost signs. But why was I so fascinated from the start? Why is it one of the parts of my final year curriculum I remember best, despite the ghost sign project's minimal contribution to my grade? "Funnily enough, visually, ghost signs seem to fit in with a particular aesthetic that's in vogue at the moment, that vaguely vintage combination of exposed brick, subway tiles and recycled pallets," observed Antonia Hart, the author of Ghost Signs of Dublin. She said she's even seen mock-ups of ghost signs around town to fit that old-fashioned look that's so popular with certain Instagrammers. "I've seen a fake ghost sign painted on a brick wall inside a cafe, and there's one in Pearse Station (Cadburys) which isn't real either, it's a remnant of a film," the writer and researcher noted. Emma Clarke, who runs the popular blog dublinghostsigns.com, says the reason these echoes of the past prove so interesting to us is that they also tug at our heartstrings. "I think people feel a mixture of curiosity and nostalgia when they see these old signs," she stated, "Ghost signs and vintage shopfronts often make people think about the people who owned or worked for the businesses in the past." Indeed, in a time when rose-coloured glasses are practically everyday eyewear, it makes sense we'd be drawn to these harbingers of history. "The signs are remnants of a different time – when there were brushmakers, victuallers and dairies around the city – a real contrast to today's convenience stores and fast food outlets," Emma reflected. 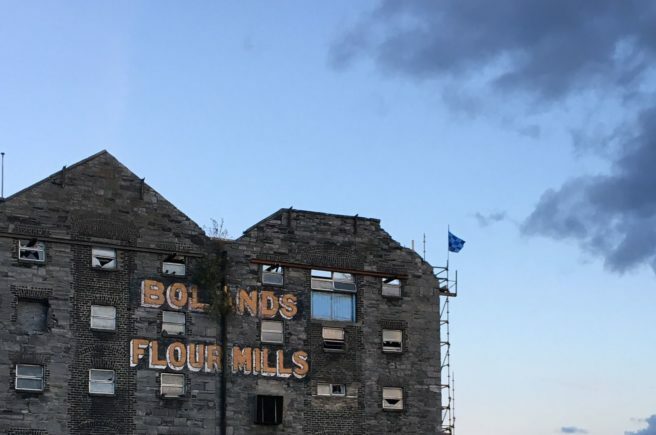 The Dublin Ghost Signs Instagram account is brimming with hundreds of posts, and it's an easy rabbit hole to fall into – as is the world of ghost signs in general. Some history buffs, like Frank, are so deep into it that they walk through the Dublin of the past, rather than the present. These ghost signs are their landmarks. "I often say to people, and they think I’m crazy, but when I walk the city streets, I don’t see the modern world at all," he says, "I’m walking through the Dublin of the 1950s or the 1930s or the 1890s because that’s the world that’s all around me that I care about and that I notice." Frank's interest in ghost signs comes from his boyhood days, looking for old coins, and later on when he noticed simple indicators of a city's commercial past. One prime example is the half door, also known as a stable door, which is split into a bottom and top half to keep animals either in or out – a sign of a society that relies on animal husbandry. He noticed them while travelling in Mexico about three decades ago, and quickly thought of the doors back in his father's hometown of Mallow, Co Cork. All those half doors were gone from Mallow by the time he'd returned from his years abroad. There remained some hope, though – there was a half door on the street in Dublin he used to walk down every day to go to school. "I went by it six months ago and it was still there," Frank recalled. Because he didn't have a phone or a camera on him, he couldn't capture this small reminder of Dublin's history at the time. He returned a few weeks to take a photo of the door, but it had disappeared. And it's not the only remnant of old Dublin that's vanished overnight. The city is changing rapidly, and as many are saying (though with different tones depending on who you're talking to), the boom times are back. Cranes are scraping clouds all across the skyline, and ghost signs are under threat. To Frank, this is a great loss. "Well, I think it’s tragic," he said, "I suppose the world is divided between the people who want to preserve everything and the people who want to demolish everything." He has some hope, though, saying, "Fortunately, I think there’s much greater awareness now of the value of things like ghost signs. I think architects in particular… would be interested in preserving remnants of history." Emma sees the integration of ghost signs into current businesses as a way of honouring Dublin's past while still moving forward. "Sometimes during a renovation or refurbishment, an old sign or shopfront is uncovered and the owners decide to incorporate aspects of the old business into the new design," she explained. "It is great when some link to a building's past is retained, but of course, it's not always possible and cities have to move on." She points to one example on Capel Street to illustrate her point. Walsh's used to operate out of 159 Capel Street, where Klaw now dishes out seafood. The new occupants have paid tribute to Walsh's by mounting its sign inside the restaurant as decoration. Antonia has a similar mindset to Emma, saying, "The city has to be dynamic, and you can't keep everything just because it's old. But it would be nice if as little destruction as possible took place – if you could layer a new sign over the old rather than ripping it out." "But that won't always be possible," she admitted, "At the very least, it takes three seconds to photograph the sign for posterity." That's why books like Antonia's, blogs like Emma's, and assignments like Frank's prove so very important. Ghost signs may disappear, but the work of these historically-minded heroes preserve what they can. I hope the next time you're in city centre you look beyond modern Dublin, into the past that still peeks through.